BIXOLON Co., Ltd a leading global Mobile, Label and POS Printer manufacturer today announced the launch of a NEW mPOS technology website, DOCS.BIXOLON.COM aimed at the System Integrator and Software Developer community to provide support centred around BIXOLON’s B-gate intelligent hub solution. The site supports BIXOLON B-gate SDK API integration information for applications and test sample code. 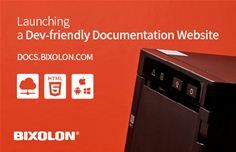 This enables developers to integrate BIXOLON printing technology into their cloud-based (remote printing) and web-based (local network printing) applications, supporting HTML5. Alongside native applications for Windows®, iOS® & Android®. DOCS.BIXOLON.COM provides an insight into B-gate through tutorials, development environments, sample apps, APIs and a complete technology guide. Launched in 2017, B-gate is a cost-effective intelligent mPOS hub solution which seamlessly connects to the host tablet device (via Bluetooth communication) while supporting 1 charging port and up to 4 USB peripherals (scanner, cash drawer, customer display, RFID reader scales, etc). The mPOS hub can print receipts or online orders through a native, web and cloud-based mPOS application with B-gate SDK’s (Software Development Kits). BIXOLON’s mPOS connectivity hub is available on the following BIXOLON thermal printer models – B-gate, SRP-Q300H and SRP-F310II. For more information visit http://docs.bixolon.com/index.php or alternatively speak to your local BIXOLON sales representative.